Explore the many options open to dancers like you and take the first steps in discovering your dance career. Have you been asked with a doubtful look what you plan to do with your years of dance training, or if you plan to get a “real job” when your dancing days are done? Have you doubted your own dreams about becoming a dance professional? We have. We were once dancers in training who followed the path toward professional careers without always knowing what our next steps would be. We took this road not because we couldn’t do anything else but because we didn’t want to do anything else. Our combined 65 years of experience has taken us on three unique journeys as performers, choreographers, independent artists, teachers, writers and publishers. 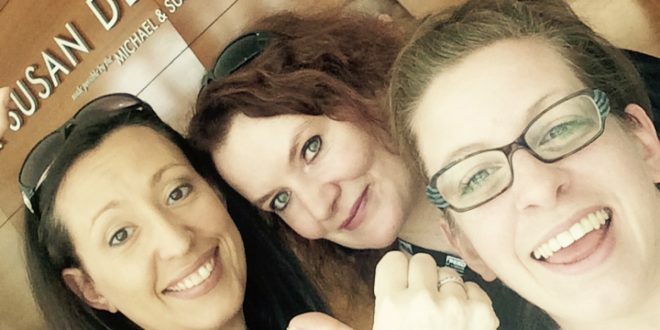 What the three of us have in common is our shared mission to help dancers who dance because they have to. Our websites are well-known for being packed with resources and advice for just this sort of dancer. Whether you are just a few or many, many steps behind us, we want to help you along your path. What the three of us have learned is that no one path in dance is the right one. Dance professionals often wear many hats and an indirect path is sometimes the most effective way of keeping dance in your life for the long haul. What the three of us know, is that there are people in dance who have started late, who’ve changed direction, who’ve overcome injury, who’ve never been performers and who work “real jobs” in all corners of the professional dance world. Armed with this awareness, the dance world is full of limitless possibilities for dancers and dance-lovers like you. While understanding your options makes the realities of a career in dance no less challenging, it does help you make smart decisions. So, what the three of us are going to do is introduce you to a spectrum of dance jobs and the professionals who do them through informational interviews. Career counselors all know the power of the informational interview, an informal conversation you have with someone already working in a career field that’s of interest to you. What’s in it for you? Firsthand information about the realities of working in dance (the kind that you can’t just Google). Discovering career paths that you didn’t even know existed. Insider knowledge about how to prepare and plan for a life in dance. Learning what it’s like to work at a specific organization or in a specific job. At the moment, your contacts in the dance industry may be limited. Maybe you don’t have access to the many kinds of people it takes to run the dance world like big-city company directors, designers or dance wellness specialists. Perhaps the thought of making uncomfortable phone calls or sending emails to strangers has you sweating into your dance shoes. We’ve made it possible for you to explore a variety of career options in dance without making a single, uncomfortable phone call. We’ve reached out on your behalf to our contacts, asking nearly 60 dance professionals from all corners of the dance world, including those in dance education, dance production, communications and more, to open up about what it’s like to do their jobs every day. We spoke to dance professors, artistic directors, choreographers, stage managers, dancewear designers, photographers, nutritionists, marketing professionals, novelists, K-12 educators, competition judges, company managers, coaches, Broadway dancers, pointe shoe fitters and more. They’ll share where they started (spoiler alert: most of them have been where you are) and the path they took to get to where they are now. They’ll describe their duties and what a typical day in their lives looks like. They’ll talk about the most rewarding parts and the most challenging parts of their job. They’ll offer advice to those who are interested in the dance field. 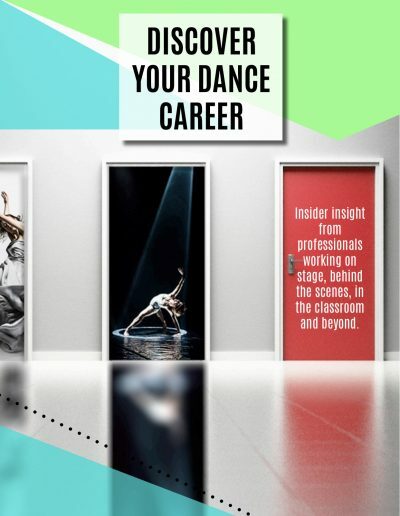 In addition, we’ve added detailed job descriptions that provide valuable information about each career at a glance, pages of additional career resources and an appendix of contact information for the dance professionals we’ve interviewed. This is the resource we wish we’d had when we were starting our dance careers. Take the first step and discover your dance career. You get all of the above for an introductory price of $9.99. Your future in dance begins with what you imagine today! We want to help you see yourself in the dance career you’ve always wanted or maybe even one you’ve not yet imagined. Imagine it and then dive deeper into the dance path that interests you. Gain the confidence to send those emails, make those phone calls and find a mentor to guide you. We believe in your ability to carve your own unique path in dance!